Jennifer worked with Population Services International planning and conducting behavior change interventions, mainly with at-risk youth. My time volunteering in China helped me clarify my future career plans. While abroad, I perfected my Mandarin skills, learned more about the implementation of medicine in a hospital and in the field, as well as what it takes to successfully run an organization. Prior to volunteering with PSI, I had planned on practicing medicine in Asia to advance my goal of providing better medical care to those in need. While I still wish to practice medicine, I now intend to pursue a degree in health care management. I want to find out what makes people sick, and how to change that. Emily worked with Center for Mediation, Peace, and Resolution of Conflict International Inc. to improve the lives of refugees. "This time, I came down with the main focus of leading mediation trainings with migrant populations in Quito, but was motivated to look deeper at how to work within the refugee community." I left Ecuador with a new understanding of how immigration affects families and individuals and a new perspective on my own life and personal values. I saw a group of people who had been forced to leave everything they knew to save their lives, and made a conscious decision to make the best of their new situation. I heard stories of unimaginable cruelty, but what stuck out was their perseverance in the face of adversity. My experience not only opened my eyes to the reality of displaced people, but also opened me up to a new culture and a new set of values that places family above financial success. Erica worked with AYUDA to empower youth to serve as agents of change in diabetes communities around the world. The Christianson Grant from the InterExchange Foundation changed everything for me. After my teaching job ended, I was able to work full time on the projects I was most passionate about. Suddenly our plan of building a national network of youth living with diabetes was a reality and I couldn’t wait to begin. 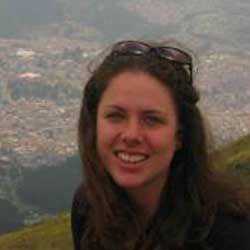 Katherine worked with Global Health Access Program to provide healthcare to her community. Building a relationship with the local coordinators is essential to our success. It is easy for me to call them and tell them my ideas, but we want them to help develop the ideas themselves. 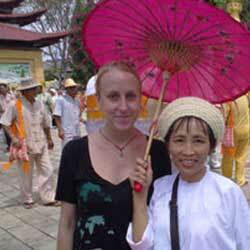 Many Myanmar and Karen are by nature very shy, so I made extra effort to be friendly and accessible. Over time, they grew to trust me and instead of being afraid to call me, they would call at 7 a.m. insisting that we meet that morning. Andrew worked with Kilimanjaro Christian Medical Centre as a data manager and research assistant in the hospital. From teaching a Maasai warrior how to use an iPod to home visits in a mountain village and playing soccer with the local children, it goes without saying that my understanding of Tanzania was shaped by the people. It’s no secret that there are many ways in which the country can improve in the coming years, but getting to know children, taxi drivers, teachers, tour guides, medical students, and doctors presented viewpoints that don’t typically reach far across cultural boundaries. 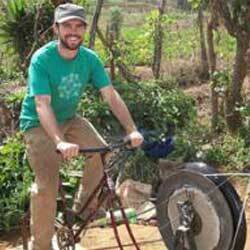 Aaron got involved in his host community by volunteering with Maya Pedal, Semilla Nueva, and El Nahual. It was so exciting to be working somewhere where there is so much potential for positive change. It was bittersweet to leave Xacana after seeing the potential impact that continued work could have there. I’m happy that perhaps a few of the kids in Xacana learned something and gained some perspective from me. Rachel Jo worked with Fundacion Tradiciones Mayas, a fair-trade organization that connects cooperatives of Mayan women back-strap weavers in Guatemala to U.S. markets to provide them with a more sustainable income. 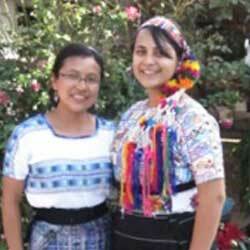 Every day I worked alongside intelligent Mayan women who were now giving back to their own communities and empowering other Mayan women with the skills and education to overcome poverty. These women warmly welcomed me into their lives, teaching me words in their Mayan languages, sharing traditional meals with me, and conversing with me about their lives and histories.